New faculty in the Department of Astronomy and Astrophysics. Top row: professor Ruth Murray-Clay, assistant professor Ryan Foley, and assistant professor Alexie Leauthaud. Bottom row: adjunct professor Kevin Bundy, associate professor Brant Robertson, and assistant professor Andrew Skemer. Six new faculty members have joined the Department of Astronomy and Astrophysics in the past two years, bringing with them a wide range of expertise in some of the most exciting areas of astronomy and cosmology. UC Santa Cruz has long been recognized as one of the world's leading centers for both observational and theoretical research in astronomy and astrophysics. Some of the department's biggest stars are reaching retirement age, however, including two members of the National Academy of Sciences, professors emeriti Sandra Faber and Stan Woosley. Department chair Enrico Ramirez-Ruiz said the new faculty are crucial to maintaining the department's tradition of excellence. "These are all up and coming young faculty who are already having tremendous impact in their fields," Ramirez-Ruiz said. One result has been a big shift in the age distribution of the department, which Faber, for one, said she welcomes. "Youth matters, and somehow the atmosphere in the department really is different--you can feel the optimism and the energy, and it makes the department a fun place to be," she said. The new faculty are joined this year by one of the largest and most diverse classes of new graduate students in the department's history. Ramirez-Ruiz said he sees the diversity of the department as integral to the science, noting that many studies have shown how groups of diverse individuals with differing viewpoints outperform homogenous groups to find solutions that are more innovative, creative, and responsive to complex problems. "Diversity, equity, and inclusion are the science leadership issues of our time, and I see enormous potential and opportunity in the growing diversity of our nation and of the field of science," he said. "As we welcome more diverse individuals into astronomy, we increase the potential to do great science, with the best minds and most diverse perspectives our field has ever seen." The new faculty include theorists, observers, and instrument designers, with interests ranging from exoplanets and planetary systems to exploding stars and dark energy. 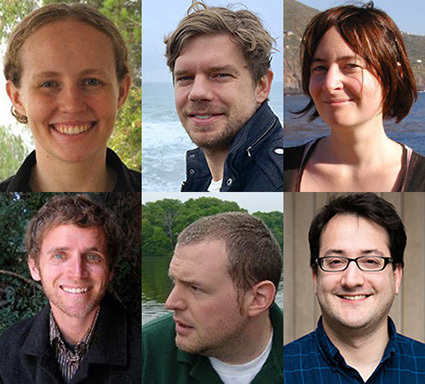 The 2016 arrivals include professor Ruth Murray-Clay, assistant professor Ryan Foley, assistant professor Alexie Leauthaud, and Kevin Bundy, an adjunct professor and associate researcher with UC Observatories. Associate professor Brant Robertson and assistant professor Andrew Skemer arrived in 2015. Murray-Clay studies how planetary systems form and evolve. She is working to understand newly discovered planetary systems around other stars using a variety of theoretical techniques. She also leads a team in the Outer Solar System Origins Survey, studying objects in the outer reaches of our solar system for clues to its evolution. In 2015, Murray-Clay won the Helen B. Warner Prize for Astronomy, which recognizes the exceptional contributions of astronomers under the age of 36. While Murray-Clay takes a theoretical approach to studying planetary systems, Skemer focuses on the observational side, specializing in direct imaging of exoplanets. He is developing new astronomical instruments and observational techniques to improve the ability of astronomers to see and study very faint planets near their bright host stars. Skemer won a Sloan Research Fellowship in 2016. Bundy is another expert in astronomical instruments and observational astronomy. He is leading work on a key instrument for the Thirty Meter Telescope (TMT) called the Wide Field Optical Spectrograph. Bundy's other main project is leading the Mapping Nearby Galaxies at Apache Point Observatory (MaNGA) survey, one of three core projects for the Sloan Digital Sky Survey IV (SDSS-IV). Bundy and Leauthaud (who are married) spent the past five years in Japan at the Kavli Institute for the Physics and Mathematics of the Universe at Tokyo University. Leauthaud is a cosmologist who studies questions related to dark matter, dark energy, and the relationship between dark matter and galaxies. She uses data from large galaxy surveys to measure the gravitational lensing effect (when a dense aggregation of mass bends the light from a more distant object), which can be used to understand the distribution of dark matter in the universe. Foley, who was awarded a prestigious Packard Fellowship for Science and Engineering in October and also received a 2015 Sloan Research Fellowship, is an astrophysicist who studies exploding stars (supernovae) and other transient celestial phenomena, and uses supernova observations to study dark energy and cosmology. He is leading two surveys, the Foundation Supernova Survey and the Swope Supernova Survey, which will set the foundation for future cosmology projects such as the Large Synoptic Survey Telescope (LSST) and the Wide-Field Infrared Telescope (WFIRST). Robertson is a theoretical astrophysicist who uses the world's most powerful supercomputers to simulate the physics of galaxy formation. He uses theory to develop science programs for the major new NASA observatories, WFIRST and the James Webb Space Telescope, and for the LSST, currently under construction in Chile. Robertson and Foley both lead WFIRST teams helping to plan projects and strategies for making the best use of the telescope. Ramirez-Ruiz said the campus's investment in astronomy faculty, including the next generation of instrument designers, is particularly significant after a period of budgetary uncertainty and changes in the way UC supports UC Observatories and the Lick Observatory astronomers based at UC Santa Cruz. "Thanks to the leadership and vision of our dean, Paul Koch, the campus has made a big investment in the excellence of the astronomy program by hiring all these great people to replace those who have left or retired," he said. A $160,000 gift from James L. Gunderson and Valerie J. Boom has helped the recruitment effort by establishing the department's first endowed chair, the E. K. Gunderson Family Chair in Theoretical Astrophysics. The chair honors the work of Gunderson's father, a psychologist whose work on human adaptation to confined and extreme conditions was used by NASA in understanding the implications of space travel. The strong reputation of UC Santa Cruz in astronomy and astrophysics not only attracts good faculty, it also helps the faculty recruit good graduate students and postdoctoral researchers. Ramirez-Ruiz noted that graduate students who earn Ph.D.s in astronomy and astrophysics from UC Santa Cruz routinely win prestigious postdoctoral fellowships. This year, those include Morgan MacLeod, now a NASA Einstein Fellow at the Institute for Advanced Study in Princeton; Caroline Morley, a NASA Sagan Fellow at Harvard University; Elizabeth Lovegrove, a Metropolis Fellow at Los Alamos National Laboratory; and Jennifer Burt, a Juan Carlos Torres Fellow in Astrophysics at the MIT Kavli Institute for Astrophysics and Space Research. "Our most recent graduating class was very successful in landing highly desirable, well recognized postdoctoral positions," Ramirez-Ruiz said. "I look forward to seeing what our newest class of amazing graduate students will do."